I made my friendship bracelet last night (I used the diamond pattern in this tutorial), I chose to use pale yellow, lilac, pink and light blue and added some studs - I absolutely love it! I'm tempted to make more and stack them for summer. Oo and I'm torn, should I stud the shoulders of this denim jacket or leave it alone? I think it'd look awesome studded but would it make it less wearable and more likely to go out of fashion? Hmmm let me know in the comments which I should choose! Don't forget to spread the loveliness! Love the backpack! I have been looking for a jacket like this forever, its beautiful! wow! i love your outfit, great put-together :) LOVE your style! i love the bag, it will be perfect when you go to usa, im so jealous! have fun. ok, I must say this: YOU ARE AN ARTIST! Those shoes are gorgeous and they were made by you! Oh wow, I am such a huge fan of your backpack! 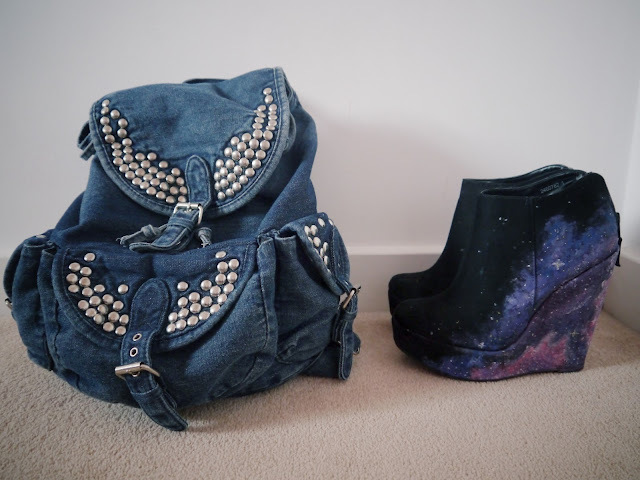 I am in love withj the wedges!! !